I downloaded the public Beta 1 of EMC Retrospect 8.0 for Macintosh. For years, I used Retrospect to back up my Windows machines. 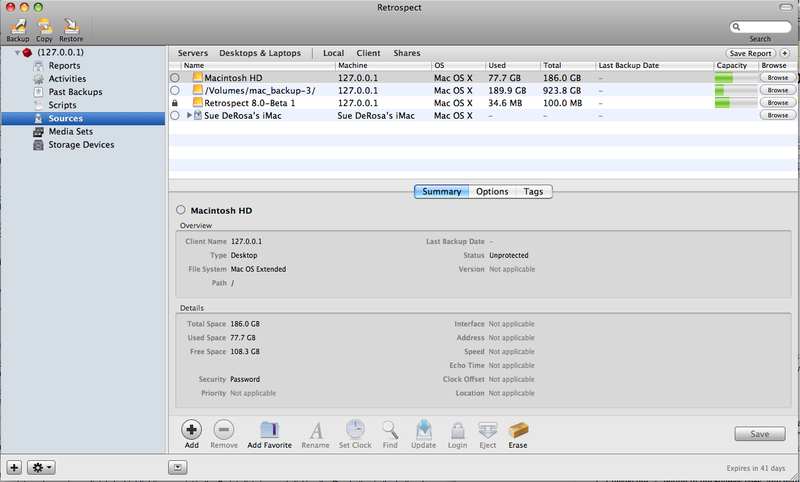 When I switched to Macs at home, I looked for a better backup tool, and eventually tried Memeo LifeAgent for Mac. It was terrible. Chastened, I switched back to Retrospect, this time for the Mac (of course). It did the job and was rock solid, but it had its quirks as Mac applications go. Some time back, I read the announcement of the updated Retrospect for Mac product. And then I read about the public Beta. Should I trust the backup of my personal information to a Beta-level product? Sure, let’s throw caution to the wind. So I gave the first Beta of Retrospect 8.0 for Macintosh a whirl. There are many differences between the 6.2 and 8.0 products, in every area. There are significant changes to the backup architecture, how the application runs under the hood, and the UI. EMC changed Retrospect’s terminology for backup sets, selectors, etc. That’s only skin deep, but it still takes a little getting used to. Retrospect now has two components: An engine (aka server) and a console. The server can run on the same machine as the console, or on a different machine. And you can run multiple servers. This allows you to control multiple backup engines, on multiple machines, from one console. While a great design notion, it’s overkill for the average, or even advanced, consumer. There will be multiple editions Retrospect 8.0 for Macintosh, and of course small or medium companies might use this feature. I’m sure EMC did a bang-up job of feature set definition — I’m only saying that this is a bit of overkill for individual consumer use. This Beta has limited compatibility with the 6.x product. There’s no script importing, and no support for restoring from, or converting, a 6.x Backup Set. 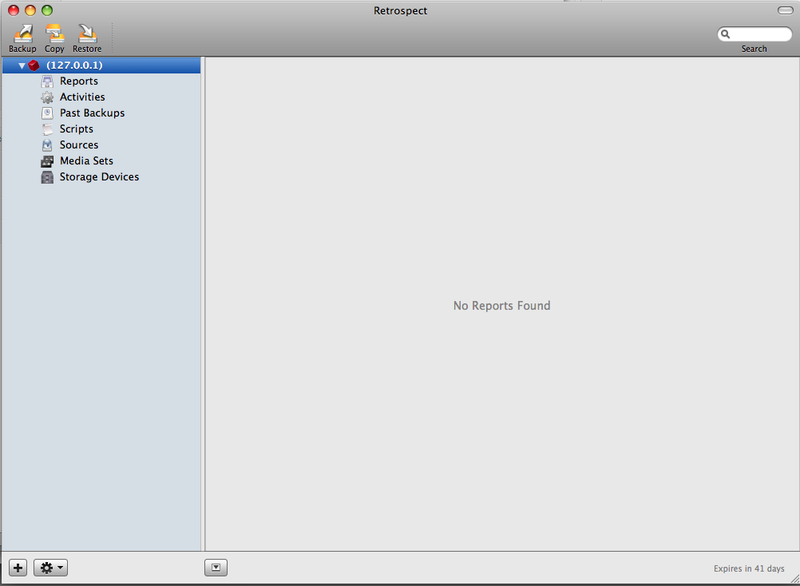 But it does communicate with the Retrospect Client for Mac version 6.2. I don’t know how much 6.2 compatibility will be in the final release; for example, it might support script migration, but not Backup Set conversion. Time will tell. Script creation looks like it’ll be much easier in this new version, so I’m personally OK with there being no compatibility or import feature at all. Installation was easy. After you download the disk image (.dmg) file, you’ll find it contains three installation files. You first run engine.pkg, and then run console.pkg. You’re done with installation. Either put the application icon in your Dock, or do a Command-space-Retrospect-return. You’re now running the Retrospect console. the bottom bar containing the “+” add button to add a Retrospect server, the gear icon Action menu button, the show/hide button for the details pane, in addition to a variety of context-sensitive buttons based on the selected component in the sidebar. If, like me, you’re running the console and server on the same box, you’ll appreciate that configuring the console to talk to the one server is easy. You just click a “+” to add your first (and only) server, and enter localhost for its location. That the console can control multiple servers is interesting, but I’m certain it’s one feature I’ll never make use of in my home. I clicked the “+” button in the Sources view, and manually entered the iMac’s TCP/IP address. The iMac’s client wasn’t automatically detected. I used the Backup Assistant to create the backup script. Although the screens differed from 6.2’s EasyScript process, the steps were essentially the same. I selected the MBP and iMac as backup sources, and the “All Files Except Cache Files” rule. From the Readme file, and comments within the Beta support forum, I wouldn’t advise attempting rule customization. Just use the rules in the Backup Assistant’s pulldown list, and wait until at least Beta 2 to try anything fancier. You can optionally encrypt the Media Set with a number of encryptions, including AES-256. The Media Set definition was a tad confusing. You first define a Media Set, and then at least one “member” of it. The support forum had a couple of, “What? Huh?” type comments about this, and I hope they simplify it, or offer better visual guidance, by the time the product ships. 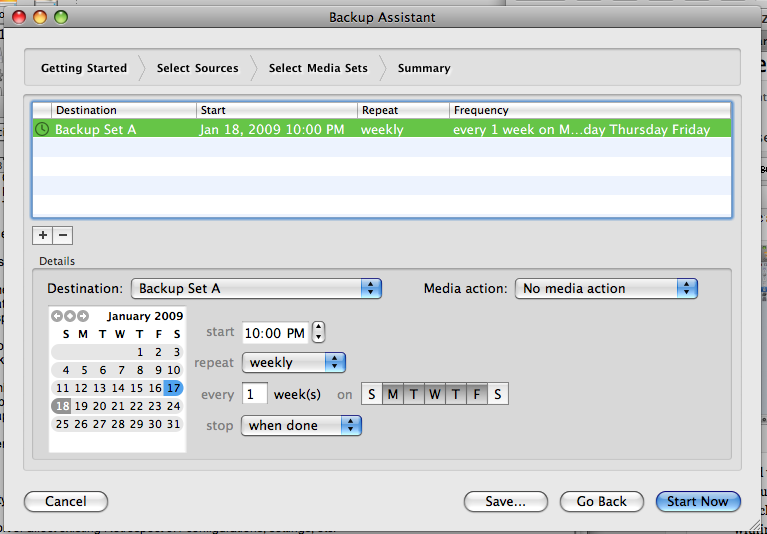 At the end of the assistant, you can run the backup immedidately, or schedule it, i.e., save it as a script and schedule it. The UI was decent… This kind of window doesn’t need to be fancy, just functionally unambiguous. Which it was. To run a script, you select it in the Scripts window, and click the “Run” button. A little bit of UI eye candy occurs, and you then have to switch to the Activities window to monitor what’s happening. The monitoring view was OK. I believe redesigning it is on their list of pending changes. The great news is, Retrospect 8.0 runs much faster than the 6.2 version. iStat Pro showed it getting more than 100% of a “processor” on my dual-core machine, so something’s been rewritten or recompiled to be multi-threaded. 🙂 Yes, the network and NAS read/write times won’t change. But on my system, let me tell you that Retrospect 6.2 spent a lot of time figuring out what files to back up. Whatever they’re doing differently for file status evaluation, it’s way, way faster. The backup eventually finished. But I managed to wedge the Retrospect server twice, and rebooted my MBP as a result. (I could have manually restarted the daemon, but I wanted its brains to be as unscrambled as possible…) I also had to exit and restart the Retrospect client a few times, because its view windows got confused. And the communication between the server and client (on the iMac) hung up twice. Hey, it’s a Beta! EMC’s support forum for this Beta shows a decent responsiveness to, and appreciation of, user submitted bugs, comments, and suggestions. My only complaint is that its search tool stinks. There’s also a Retrospect product development blog you can follow. I won’t rely on this Beta for our backups, because the propensity for hanging (in the server, console, or client network communications) is too great. This sucker went bye-bye way too often to rely on it for day to day use. But, hey, it’s a Beta! It’s clear that EMC is on the right track for a great successor to Retrospect 6.2. I like the UI, even in its unpolished state. And the console assistants. The execution speed increase was very welcome and almost thrilling. Being able to interact with the console, as opposed to 6.2’s unresponsiveness when it’s thinking, was great! I’m hoping they stay on schedule, because it looks like upgrading to Retrospect 8.0 would be money well spent. I’ll watch for the Beta 2, and try it; perhaps that’ll be good enough for daily use at home. Seems it’s out on its first full release now (just got an email to that effect). I’d welcome any comments on experiences using it, etc. In particular, I’m interested in having two sets of backups, one to an external hard drive and one to an “archive” of DVDs (which I’ll take off-site). @Heraclides: Will do. In fact, I have such a post half-written. Things got in the way of completing it. I hope to post it by end of day tomorrow. Briefly: It feels like they rushed it out the door. They went from Beta 5 to Gold (i.e., product release) without intervening Release Candidates. I was surprised by this, because Beta 5 wasn’t anywhere near Gold quality. And, sure enough, I’ve already bumped into bugs that were reported in the Betas, but still aren’t yet fixed. And some functions that were initially advertised as important for 8.0 still aren’t working. But having said that, it seems to do the job for me, although backing up clients (i.e. Macs other than the one on which the engine runs) is extremely slow. Other users have noticed this as well. Until I get my post up 🙂 look through the commentary in the Retrospect 8.0 forum and Retrospect 8.0 bug report sub-forum. We have used EMC Retrospect for about a year, having switched from Backup Exec to save some money. I have regretted the decision ever since. So far, Retrospect has literally destroyed its backup sets not once, but FOUR times. I have contacted their technical support and was actually told that yes, Retrospect “randomly corrupts its backup sets” and catalogs. I tell you, honestly, I was actually given no other option than to blow away and redo my backup sets each time and was advised by another technician to “create a backup backup set” of the original, because the total destruction of backup sets is a known issue with EMC Retrospect. DO NOT purchase this software if, like me, your career depends on keeping your companies’ data backed up. I will be moving back to Backup Exec, regardless of cost, and will never look back.